Cotton Candy Party is a brand new Cotton Candy/Fairy Floss vending machine. The machine is easy to use and offers up delicious cotton candy - dry, warm, and fluffy! Cotton Candy Party is easy for customers to use but also easy for owners - the machine is self cleaning and climate controlled allowing for easy operation and service. With a low cost per vend, Cotton Candy Party is a sure-fire hit for your location. Cotton Candy Party is a brand new Cotton Candy/Fairy Floss vending machine. The machine is easy to use and offers up delicious cotton candy - dry, warm, and fluffy! 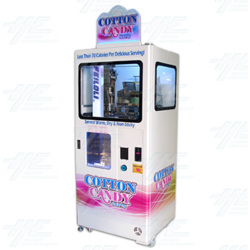 Cotton Candy Party is easy for customers to use but also easy for owners - the machine is self cleaning and climate controlled allowing for easy operation and service. With a low cost per vend, Cotton Candy Party is a sure-fire hit for your location.